Depending on the severity of our abuse, however, awareness, memory, and identity may be disrupted . In extreme cases, alternate personalities (“alters”) can develop. These may assume different physical and vocal mannerisms, even different ages, sexes, and races from one another. They may or may not be aware of one another’s existence. Once known as multiple personality disorder, the problem is today called dissociative identity disorder . A controversial diagnosis, dissociative identity disorder is far less lurid – but far more distressing – than movie portrayals would suggest. Continuity is interrupted. Education and work history become fragmented. Forming and sustaining relationships can be difficult. The “benefit” of dissociative identity disorder is that it allows victims to exhibit strengths and characteristics they might not otherwise recognize themselves as possessing. One alter may be assertive; another, flirtatious. Dissociative disorders (which include amnesia and depersonalization) are treated with talk therapy and medication. Many sufferers develop coping skills enabling them to lead productive lives. Like Humpty Dumpty’s, there is no putting our lives back together again, after abuse – not as they once were or, at any rate, might have been. But we are not as fragile as Humpty was. One way or the other, we survived the fall. The challenge for abuse victims now is to make omelets out of our broken eggs. Mayo Clinic, “Dissociative Disorders”, 3/26/14, http://www.mayoclinic.org/diseases-conditions/dissociative-disorders/basics/definition/con-20031012. Web MD, “Dissociative Identity Disorder (Multiple Personality Disorder)”, http://www.webmd.com/mental-health/dissociative-identity-disorder-multiple-personality-disorder. I like the analogy of Humpty Dumpty with abuse victims. We are very resilient although the abuse does take its toll on us. 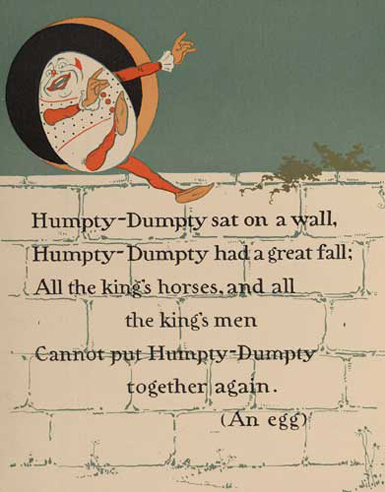 Side note: Is it just me or does Humpty Dumpty’s fall sound like suicide? Maybe I’m reading too much into it. Great post, Anna–and I understood what you wrote. Nonetheless I have a strong emotional reaction to the word “resilient”–not to you, Anna, or what you say here about it; but, a strong audio-visual memory surfaces of my mother declaring that “kids are resilient”. The context was likely in regard to our repeated relocations around the country–with no explanations given–one day we would simply be told to pack up our bedrooms for “the move”… I heard my mom utter that phrase about resiliency many times during my life with her, and to me it sounded like a too-convenient way of abdicating any responsibility for checking in and communicating with offspring, children who badly needed reassurance and assistance to adapt to significant changes. Whether the change was illness/death of a family member, or being uprooted once again and facing another new neighborhood/school/”friends”–we were just little soldiers, small adults, “resilient”; not allowed to express any feelings whatsoever–certainly not fear, resentment or confusion. Questions or complaining were punished–the sting of being judged “ungrateful” was a common response. So yes, if having survived to write comments in a box makes me resilient, truly I am. But the cumulative mental/emotional instability which resulted in a past littered with failed college, failed employment and failed relationships is an indicator, then I’m not so sure. When we arrived at the new home where I would begin my 3 yrs of high school, I recall carrying in a box and with sincerest optimism saying, “I think I’m going to like it here”. I’ll never forget my father’s face, much less his harsh tone of voice as he replied, “Well, I wish you’d try! !” The implication was clear: I hadn’t tried very hard up to then, and I needed to make a concerted effort toward insuring that his job as parent was easier. Sorry for going on and on…my parents are long gone and the pain is still raw. How distressing, Shadeau. I can only guess what prompted your parents to move so often. But I can well understand how difficult the many moves must have been for you. I am sorry to have triggered such a painful memory. That you survived to write comments in a box may not seem like much to you. In my mind though, it does make you resilient. You are the heroine of your own life — someone still capable of caring about others, despite all you went through. That alone is astonishing. I’m glad to be of some small help, Shadeau. We all need to unburden, from time to time. The weight of abuse is too heavy for us to carry alone. It is–and I am more inspired than ever to keep this blog going, and encourage others 🙂 The guest speaker at church was David Roever, a Vietnam vet who was badly scarred, physically, and miraculously survived. He answered a question all survivors of abuse ask, after they’re settled that God didn’t author/send their abuse– “Then, why didn’t He intervene?” Mr Roever says that God didn’t prevent him being so badly burned and scarred–“because God knew He could trust Dave with the scars”. Dave’s been ministering to wounded vets since 1969. Glad to know you’re empowered! 😉 Joni Eareckson Tada, an Evangelical author and radio host who is quadriplegic, speaks and writes about this, as well. It is natural for abuse victims to question God’s purpose, even His existence. But God can use us for good at any age. It may, in fact, be our scars that serve to encourage others. Yes, I’m familiar with Joni–she’s been a role model for many! And I think you’re so right, Anna-our scars serve God and others, giving them great value to be honored 🙂 God bless you again and again, always. Anna, you are giving us a real education about abuse and how it effects the victim. The main “benefit” of dissociation is survival. God gave the ability to dissociate in order to save the abuse victim from total insanity and in His time He will bring healing with lots of work and perseverance. I always appreciate your feedback, Alan. Excellent post. Unfortunately, too many do not realize the devastating effects of abuse on the brain and then do not believe the victim when parts of their story is unclear. Thanks for sharing. As Abuse Victims, Children do take the top place as they cannot understand what has happened, cannot verbalize and get over it, and often remain traumatized for life, often becoming negative themselves. I Congratulate You on Your Tireless Efforts for these. Love and Regards. And You too are Really Encouragement to me, my Dear Anna! Love, and Blessings on You my Friend! What a fabulous comment! How clever you are! And how apt that I should hand off the frying pan, since I am a miserable cook (LOL). But seriously, this post was not intended to make light of abuse or minimize the destructive impact it can have. The aftereffects of abuse may cripple victims or, at very least, keep us from pursuing a cherished dream. However, the new direction abuse dictates can be gratifying in its own right.